A century-old shot ball factory tower is open to the public once a year. In 1908 the Juhl & Sons Lead Foundry and Machine Factory (a.k.a. “Bleigießerei und Maschinenfabrik Juhl & Söhne”) built the five-story “Schrotkugelturm,” or Shot Ball Tower, in Berlin. After climbing the 197 steps to the peak of the tower, foundry workers would drop molten lead through a central tube. The draft from the free fall through the open building would cool the lead, molding it into perfectly round shot balls. The factory ceased production for good in 1939. The tower would become historically listed, then unlisted (thus unprotected and unkept), and finally listed again. 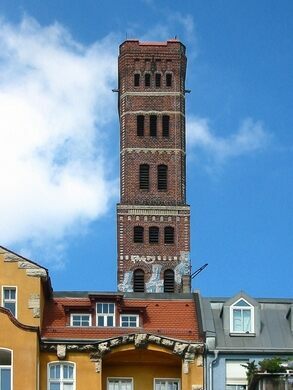 After a renovation in the late ’90s, Germany added Shot Ball Tower to its locations for Doors Open Day (“Tag des offenen Denkmals”), during which the public is invited into buildings that are normally closed off. A portable, wooden replica (minus the hyphen) of Hamburg’s iconic crooked coffee shop. This little museum is making sure that the art and history of the graffiti sticker is not scraped from history. A 142-foot-tall Q-tip on Bristol's skyline.